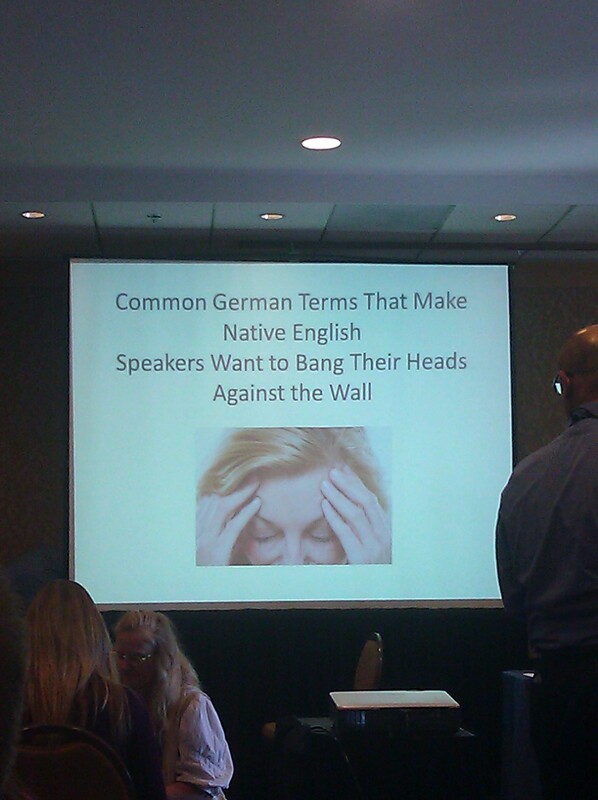 In this workshop-style session a panel of experts discussed some of their favorite “thorny enemies,” that is, German terms that are difficult to pin down and frequently mistranslated. Participants were invited to contribute their own “thorny enemies,” and everybody threw out suggestions for the best translations for these. This session had a lot of potential, with a stellar panel of German to English and English to German translators, but I was somewhat disappointed with the final result. The “contributions from the audience” part kind of made it a free-for-all, with people shouting out suggestions. And all of the suggestions were right depending on the context. Some examples included: Absatz/absetzen, abwickeln, Bereich, betrieblich, Es ist zu + verb, Fach- + anything, grundsätzlich, im Rahmen der/des, kompetent, maßgeblich/maßgebend, plausibel, qualifiziert, Sachverhalt, Wahrnehmung/wahrnehmen and wobei. The session was amusing, but I don’t feel I learned anything new. Then again, that wasn’t the point of the session. This kind of session would be a difficult one to conceive and implement, and I appreciate that the presenters banded together to come up with it.